Cu2O nanoparticles were synthesized by photoreduction of copper(II) complex compounds with ethylene glycol and glycerin in the photolite volume. 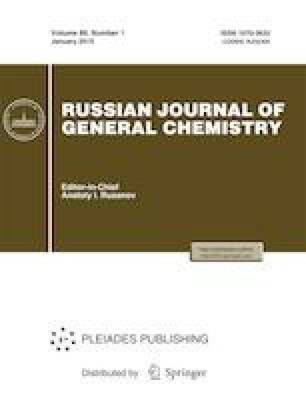 Their optical properties, morphology, phase composition, and photocatalytic activity in methyl orange decomposition were studied. The electrochemical substitution reaction afforded Cu2O/Ag composite nanoparticles. Their increased activity in photodegradation reactions of methyl orange in comparison with unmodified Cu2O particles was found. Russian Text © E.I. Isaeva, V.V. Gorbunova, V.P. Pronin, D.M. Dolgintsev, 2019, published in Zhurnal Obshchei Khimii, 2019, Vol. 89, No. 1, pp. 122–127.